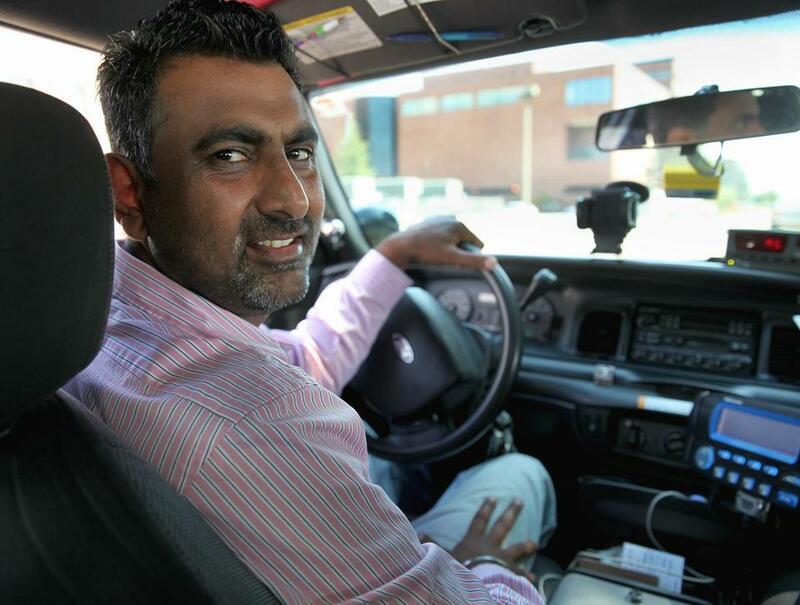 Cambridge cab driver, Parmjit Singh says in a good month he earns $1,600 after expenses. To understand why the taxi industry is so rankled by Uber Technologies, it may help to know what Parmjit Singh is up against every month. A cab driver in Cambridge, Singh starts every shift in hole. The loan for the purchase of his taxi medallion runs him a whopping $2,300 a month; commercial driver’s insurance another $700, maintenance $250. He also has to pay the dispatch company $80 a week to get fares radioed to his vehicle. In a good month, Singh clears $1,600. “It’s very hard for me to make money,” he said. On the other side of the technology divide is Larry Curtis, who’s been driving for Uber in the Boston area for about 11 months. Car payments for his 2013 Hyundai Sonata are around $350 a month, plus another $75 a month for maintenance. Like many Uber drivers, Curtis uses his personal insurance for his driving business — about $100 a month — and his only other major expense is the $10 a week he pays for the smartphone that Uber uses to send him fares. Uber takes 20 percent of every fare, but even so, Curtis calculates he makes about $3,500 a month, working 45 hours a week. “My personal experience of the Uber experience has been very, very favorable,” Curtis said. Such experiences aren’t outliers. Taxi drivers often work long hours just to break even; meanwhile, Uber has said its Boston drivers earn $26 per hour before expenses, including the 20 percent referral fee. The company has even put up recruiting ads on billboards around city boasting its drivers make $1,600 a week. Uber and other ride-sharing companies have multiple advantages over the old taxi industry and even black-car services such as livery drivers. They are subject to fewer regulations and have lower expenses because the drivers aren’t treated as commercial drivers. In December, the Patrick administration proposed regulations that would require companies like Uber to adhere to basic insurance and safety standards. But those regulations would do little to close the expenses gap between taxi drivers such as Singh and Uber drivers like Curtis. Earlier this year, the city of Cambridge backed off its efforts to more closely regulate ride-sharing services after angry members of the public said the regulations would raise prices and drive Uber away. New York City treats Uber similarly to other black-car services: Drivers pay $625 annually to register their vehicles and have them inspected, and another $84 a year for a special license. All New York Uber drivers must also have commercial insurance. Even with those restrictions, the company has more than 7,000 vehicles, amounting to almost half the city’s black-car fleet, and pays almost $5 million a year in fees. As with cabs, Uber adds a 9 percent sales tax on fares. But other cities, including tech-friendly climes on the West Coast, have been more hostile. San Francisco and Los Angeles have recently sued and settled with ride-sharing companies, saying that they have misled consumers about the background checks they conduct on their drivers. Facing a lawsuit form the city of Portland, Ore., Uber agreed to suspend its service until Portland adopted regulations for ride-sharing companies. Conversely, Uber has hailed Colorado and Washington, D.C., as models of regulation, in which ride-sharing drivers are required to carry some sort of commercial insurance, but fare regulations and service requirements are not as restrictive as for taxis. Cambridge had considered regulating ride-sharing services similarly to livery vehicles before it backed off in June, much to Zagloul Ayad’s disappointment. A part-time livery driver in Cambridge, Ayad said the paperwork alone that he has to fill out — but Uber drivers don’t — costs him time and lost fares. Moreover, Cambridge requires a minimum $40 fare for livery service, “even if you go from one building to another,” Ayad said. By contrast Uber’s cheapest service has a minimum fare of $5. Ride-sharing companies have long said that they are not comparable to cabs or black-car services, but rather are intermediaries that provide software that riders use to hire independent drivers. Uber, Lyft, and other so-called ride-sharing services also don’t have dispatching licenses with Cambridge, which cost $250 per year, said Andrea Spears Jackson, chairwoman of the city’s license commission. The only software company to have a cab-dispatching license, Hailo, has since pulled out of North America due to intense competition from ride-sharing companies. Cab companies face other expenses, said Walid Nakhoul, whose Checker Cab Company owns 25 vehicles that it leases to drivers. He can only get insurance coverage for his vehicles from the state’s high-risk coverage pool, which costs $10,000 a year for each car; Nakhoul also pays for a full-time mechanic to maintain his vehicles. The ride-share industry’s growth shows little sign of abating. A business journal reported in November that internal Uber documents show the company on track to net some $2 billion in revenue in 2015. In June, Uber chief executive Travis Kalanick told The Wall Street Journal the company’s revenue was “at least doubling every six months.” In late 2013, Lyft, another popular ride-sharing company, reported revenue growth of 6 percent — a week. But for Singh, the cab driver, the figures are much smaller. After paying his business expenses, he estimates his income is half of what it was three or four years ago, before Uber and other ride-sharing services came to town. Instead of $100 days, they’re more like $40 or $60. Jack Newsham is a Globe correspondent. He can be reached at jack.newsham@globe.com. Follow him on Twitter @TheNewsHam.